There is something intensely satisfying about baking a cake. I find every stage enjoyable; planning what you will make, the therapeutic measuring mixing and whisking, the pride you feel in it sitting there looking all pretty, and of course devouring it with a nice cup of tea. I haven’t baked for quite a while – I am fighting a losing battle against an expanding waistline and Tim (that American on MasterChef is my husband so step back Twitter groupies) does tend to somewhat monopolise the kitchen. I can hear Tim’s protests as I type this, because usually I don’t mind. I like cooking main meals, but it never produces the same kind of joy I get from making desserts. This probably has a lot of do with my terribly sweet tooth, but I also think there’s a delightful decadence in making something just for fun. No nutritional benefits, not to use up the leftover veg in the fridge that’s starting to go brown around the edges, just baking something that’s a treat. The double celebration of my step-dad’s 70th and Mother’s day on the third of April was the perfect excuse. Don is a complete sucker for chocolate cakes, so I decided to break open my new MasterChef at Home cookbook and give Dhruv Baker’s Dark Chocolate and Almond Torte with Amaretto Cream, Raspberries and Passion Fruit at whirl. Before you get too impressed, I dismissed the cream and fruit and just went for the cake. Recipe is here courtesy of Gluten Free for Kids website. 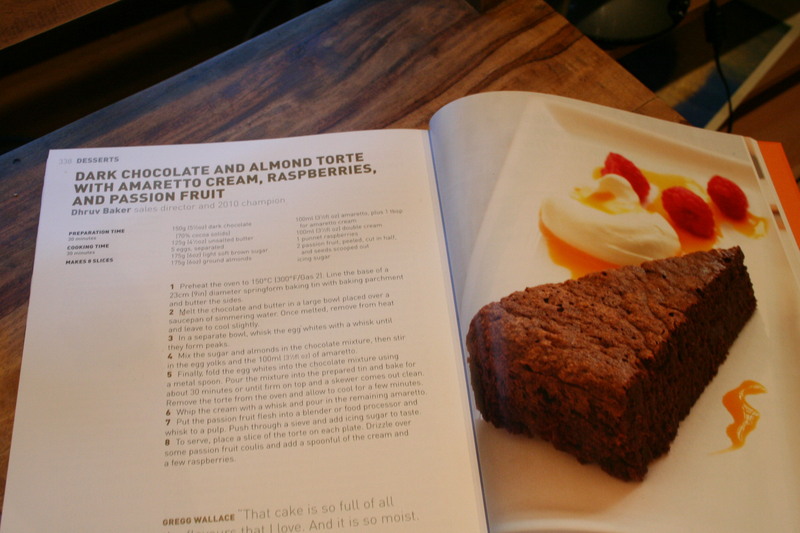 I stuck with the ground almonds and the cake was still lovely and moist, but I did substitute Amaretto for Shannon White Chocolate Irish Cream as that is what we had knocking around. The chocolate was Lindt dark almond and Sainsbury’s Taste the Difference Peruvian Fairtrade Dark Chocolate.